We all know Thanksgiving, the day when people in the Unites States and Canada (originally) give thanks for the blessing of the harvest and for all good things of the preceding year. Every year on the second Monday of October in Canada and on the fourth Thursday of November in the United States families gather for a day of feasting, football and being together. But have you heard about Friendsgiving? A spin-off of America’s time-honored Turkey Day, Friendsgiving has emerged as a growing holiday trend that brings friends together as a replacement for, or in addition to, the traditional family-focused Thanksgiving festivities. Friendsgiving festivities are mostly hosted on the Wednesday before or the Friday after Thanksgiving, giving friends the opportunity to just bring extra food, that has been prepared for or is leftover from Thursday. 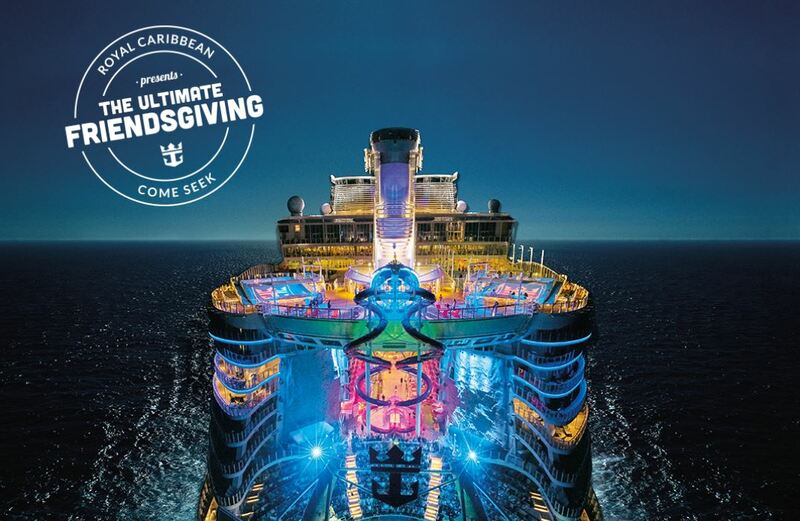 A champion of being adventurous and starting new traditions, Royal Caribbean is taking the holiday to the next level by transforming an exclusive VIP sailing, Nov. 10-12, into the Ultimate Friendsgiving Celebration. After all, what better way to celebrate friendship than on a ship named Harmony? In addition to custom Friendsgiving menus and cocktails, guests can challenge their friends on Harmony of the Seas’ many thrills, including sliding down the 10-story Ultimate Abyss, surfing on the Flowrider, rock climbing, plus non-stop entertainment and dining. The party will culminate with an exclusive live performance by DNCE, the “Best New Artist” at this year’s MTV Video Music Awards. Spanning 16 guest decks, encompassing 226,963 gross registered tons, carrying 5,497 guests at double occupancy, and featuring 2,747 staterooms Harmony of the Seas is the world’s largest cruise ship with the world’s best features. Nowhere else can travelers find such a bold and unexpected lineup of thrilling experiences, imaginative dining, unparalleled entertainment and the latest technology, including VOOM, the fastest internet at sea. 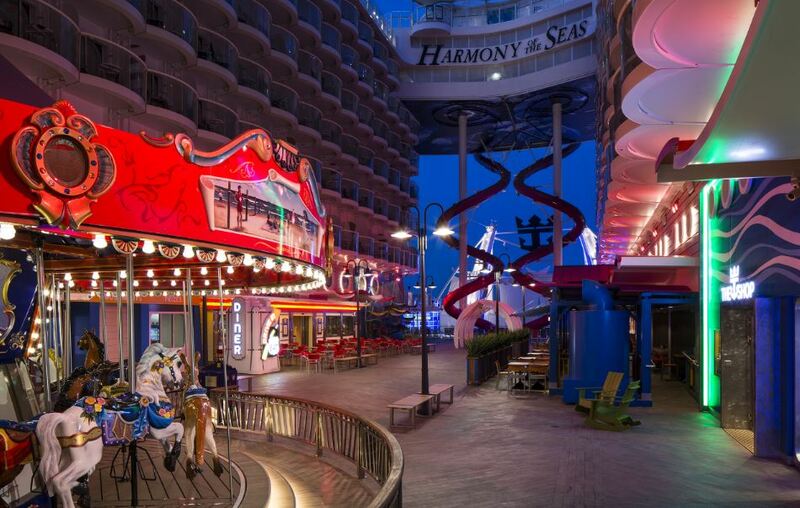 Harmony combines the iconic seven neighborhood concept that sister ships Oasis of the Seas and Allure of the Seas are known for, with some of the most modern and groundbreaking amenities and offerings that will appeal to guests of all ages. From The Ultimate Abyss, a dramatic 10-story tall slide, to unparalleled entertainment including Broadway’s hit musical Grease and distinct high diving, acrobatic performances in the ship’s trademark Aqua Theater, sophisticated dining in venue’s ranging from Jamie’s Italian Cuisine by celebrity chef Jamie Oliver to Royal Caribbean’s whimsical restaurant Wonderland, which is a unique culinary adventure for the senses, and robot bartenders, there is an adventure for everyone onboard Harmony of the Seas. For a closer look inside Harmony of the Seas click here for our Inside Harmony of the Seas post.